Blues organist Louis Pain and his trio are releasing a new CD of original songs, "It's About Time," this week. It's been worth the wait. The insert for the King Louie Organ Trio’s new CD, “It’s About Time,” looks like a photo album of friends and family. Fittingly so. Friends, mentors and family inspired Northwest blues stalwart Louis Pain’s album, as it says on the cover, and they’re name-checked in songs such as “Frances J,” which opens the album and honors his late mother, the feminist poet Frances Jaffer, who was also Pain’s first and biggest booster, signing him up for organ lessons when he was 16. Pain’s wife, Tracy Pain, is the inspiration for “Island Girl,” of which Pain says with a straight face, “If you think you recognize the melody, you’re mistaken” – after which the song opens with a brief but direct quote from the “Hawaii Five-0” theme. There are songs for grown kids and grandkids, such as the gorgeous, churchy “Bry-Yen: I Believe in You” and “Lupus Tylericus.” “Big Brothers” is exactly that, about Pain’s brothers; and “Blues for Pierre” is inspired by his stepbrother, Peter. 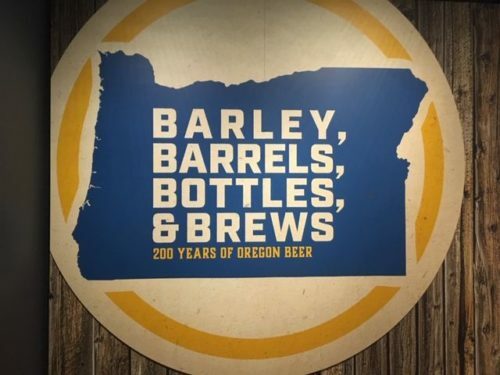 The Historical Society's "Barley, Barrels, Bottle, & Brews" tells the tale of Oregon beer culture from then to now. We'll drink to that. Oregon’s brewing industry is robust and growing, with nearly 300 breweries, hundreds of pubs and taprooms, and legions of fans thirsty for its hoppy, craft-brewed beers. But all that great beer had to start somewhere, so it’s instructive to put that pint down for a while and tour the new exhibit at the Oregon Historical Society that details the 200-year history of Oregon brewing. That love started early – if with a bit of orthographic diversity – with an entry from the Lewis & Clark journals: “Collins made Some excellent beer … which was verry good.” It probably wasn’t much like the hazy and brut IPAs that are the current Oregon favorites, it being brewed with Camas-root bread and all … but I imagine any beer was well received in that circumstance.